Peggy and Pencil are inseparable companions. They sleep together, eat together, and even take-in Friday night movies together. Life is uncomplicated and safe, and although Pencil is a Beagle, Peggy is happily entrenched in a satisfying relationship of co-dependency with her beloved pet. But with love comes loss, and Peggy’s world comes crashing down when Pencil meets a mysterious demise in the neighbor’s yard. Left to pick-up the pieces of her shattered life, Peggy embarks on a personal journey to fill the void. Friends, family and co-workers try to distract Peggy from her misery with their own obsessive quests for happiness, but in the end, she emerges from her loss with a new found sense of her place in the world and what it takes to make her happy. 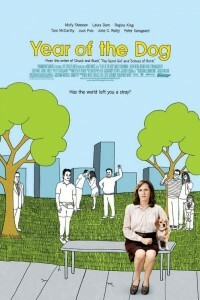 Like millions of people, Peggy (Molly Shannon) has found a comfortable niche in which to live. She has a solid administrative job, close family and the dependable companionship of her dog, Pencil. This stable status quo is rocked when Pencil’s sudden death leaves Peggy reeling in a world devoid of meaning without him. Her quest for happiness leads her to the attractive, yet ambiguous Newt (Peter Sarsgaard) who introduces her to animal activism, a vegan lifestyle and even a new dog. Inspired by Newt, Peggy unleashes an obsession with animal rights and dog placement, which greatly concerns her brother (Thomas McCarthy), sister-in-law (Laura Dern), best friend (Regina King), neighbor (John C. Reilly) and boss (Josh Pais) who all feel her life is dangerously out of balance. Unable to overcome continuing disappointment with her fellow human beings, Peggy ultimately makes a heartfelt commitment to the animal world, where, for her, the love is unconditional and satisfaction is guaranteed. Depending on how you look at it, there is good and bad news for Toy's House. A much loved festival circuit film bas been picked up by a movie studio.